Guest blog by Dr Amara Thornton, History of Archaeology Network, UCL. In 1930 Mary Chubb met architects Ralph Lavers and Hilary Waddington in Venice. All three of them were en route to Egypt to work for the Egypt Exploration Society on an archaeological excavation at Amarna, the ancient capital city of the 18th Dynasty pharaoh Akhenaten and Queen Nefertiti. At the time, Lavers and Waddington were new graduates of the Architectural Association School of Architecture; courtesy of archivist Ed Bottoms, I recently had the opportunity to look through the AA School archive in search of them. I’ve been interested in the contribution architects made to archaeology for a long time, and this was a great chance to learn more about the early lives of these two men. Happily, the archives didn’t disappoint. Although Chubb later wrote that Lavers and Waddington had barely met each other before leaving London for Egypt, the archive revealed that they both contributed to three consecutive AA pantomimes between 1924 and 1926. Held in December, these annual events were a highly creative and demanding undertaking – students wrote the scripts, composed the music, designed the sets, made the costumes and props, and staged and acted in the production. Profits from ticket sales went to the Architects’ Benevolent Fund, while props and costumes were available for sale. 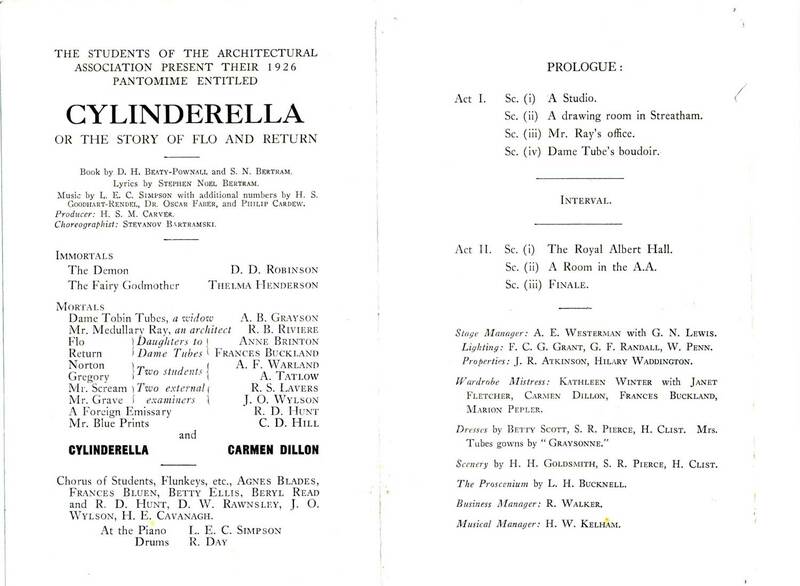 It’s no wonder then, as Ed told me, that a number of architecture students who worked on these pantomimes had – in time – successful careers in Art Direction. 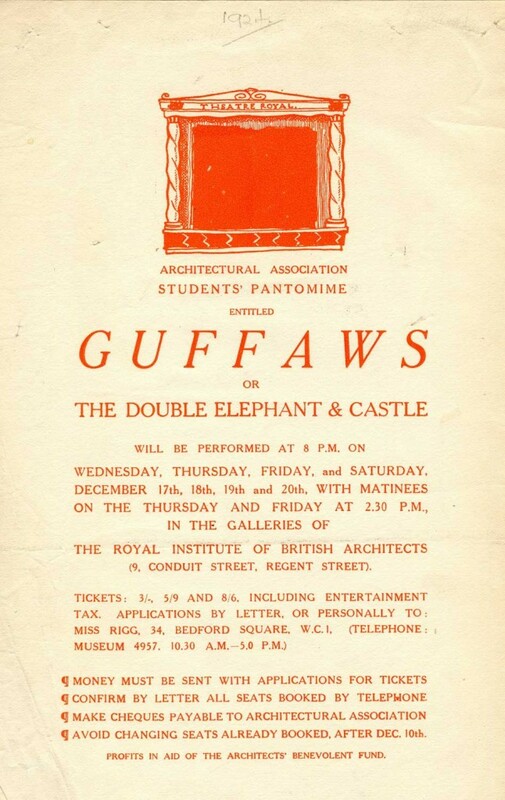 “Guffaws; or the Double Elephant and Castle” premiered in December 1924. It was revue production, consisting of eleven distinct scenes. The final programme shows Lavers acting as “Third Rustic” in Scene Five “’The Innkeeper’s Daughter’ (A Rustic Opera)” and Cabin Boy in Scene Nine “Treasure”. Waddington did not act in this production, but took part in its staging as one of a handful of Stage Manager’s Assistants (Fig 1). An intriguing photograph in the AA archive labelled with both Lavers and Waddington’s names, captures (I assume) a rehearsal of one of the scenes – though not, I think, either of the scenes that Lavers was meant to be in (Fig 2). Interestingly it seems to foreshadow Lavers and Waddington’s later work in archaeology; both examine minutely the hem of a Roman ‘Galatea’ and what looks like an entrenching tool (used for digging trenches in both archaeological and military contexts) rests nearby. 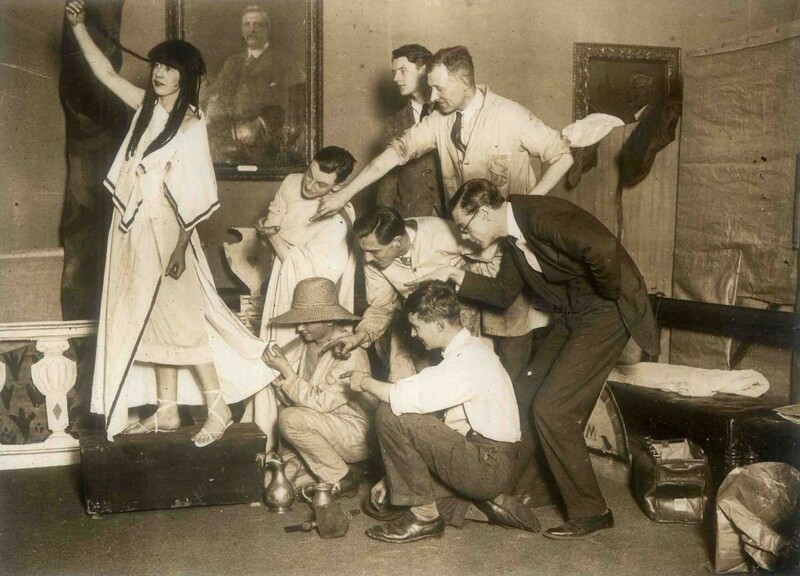 Lavers and Waddington had a more prominent roles in the 1926 pantomime, “Cylinderella: or the Story of Flo and Return” (Fig 3). Waddington worked with another student JB Atkinson to provide props for the production, while Lavers took the role of “Mr Scream”, one of two RIBA external examiners. 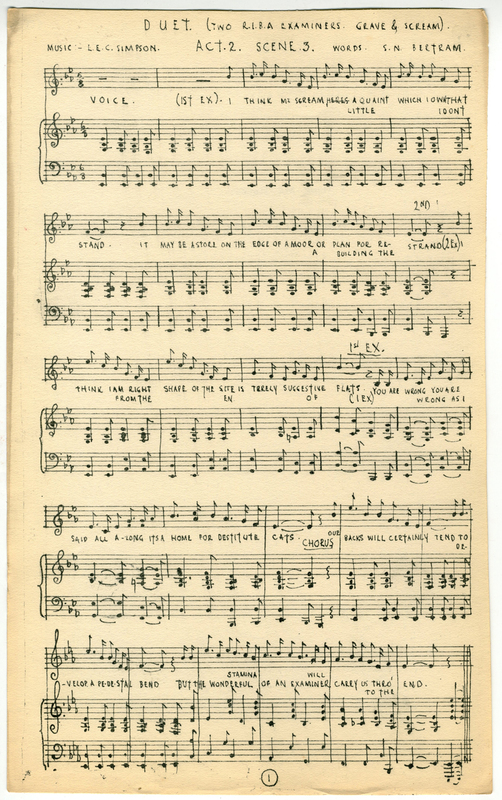 Several portfolios of sheet music from this production are held in the AA School archives, along with various production notes. These include an intriguing pencil sketch with archaeological links (Fig 4), and copies of a duet between Lavers’ Mr Scream and his co-examiner Mr Grave entitled “I think Mr Scream” (Fig 5). Fig 4. A pencil sketch found in one of three portfolios of “Cylinderella” sheet music. The three scenes depicted show a figure at Stonehenge (top) and ancient Egyptian architecture and monuments (middle and bottom). Fig 5. First page of sheet music for “I think Mr Scream”, song number 11 in “Cylinderella”. As architects for the Egypt Exploration Society’s excavations at Amarna, Lavers and Waddington were responsible for site surveys and plans. After his third season on site, Lavers organised the Society’s 1933 exhibition – an annual event at which objects from the winter excavation would be brought back to London and put on public display. Lavers’ Amarna exhibition was held at his alma mater, the Architectural Association, for four weeks during the summer of 1933 (Fig 6). His description of the display in the July 1933 AA Journal featured an image of a cast of one of the objects discovered – a portrait head, unfinished, of the famous Queen Nefertiti. Fig 6. 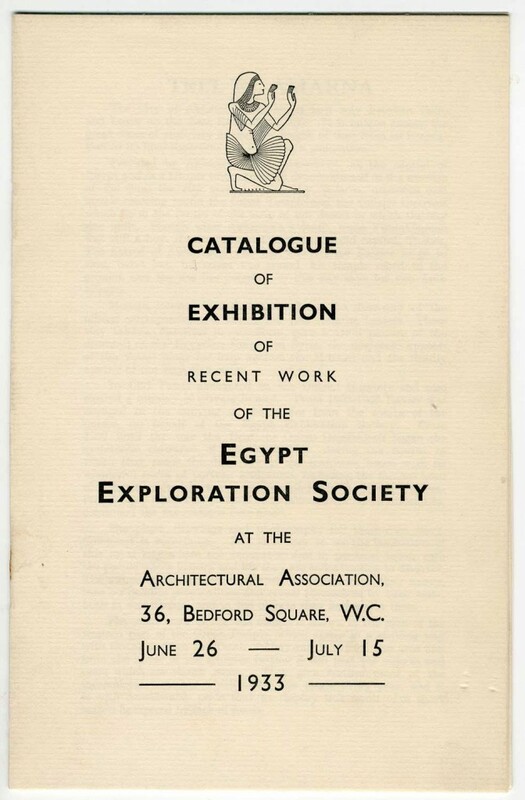 Catalogue for the 1933 exhibition of antiquities from Amarna, held at the Architectural Association. In the exhibition Lavers highlighted the work of architects in the Amarna excavation by including a range of house and town plans as well as imagined reconstructions produced by himself and Waddington. Two other AA trained architects, Seton Lloyd and J. C. Rose, were also featured. Hilary Waddington went on to a distinguished career in archaeology, working in Mandate Palestine in the 1930s and then moving to India in 1937. He remained focused on the historic built environment as part of the Archaeological Survey of India until the 1950s. 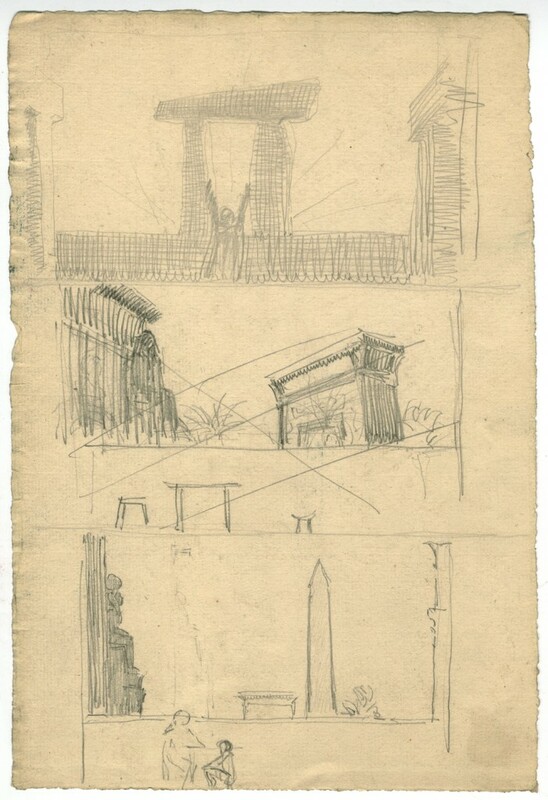 Ralph Lavers continued as draughtsman for the archaeologist Leonard Woolley’s excavations at Tell Atchana (Alalakh), Turkey in the late 1930s before moving into design and illustration. His torch design was chosen for the 1948 London Olympics and his mural designs representing the long history of farming were incorporated into the Science Museum’s Agriculture Gallery in the early 1950s as part of a new interpretive vision for the display of agricultural materials. From the 1940s to the 1960s his illustrations featured in a number of works, particularly those aimed at school-age children. Lavers’ illustrations are fascinating; the texture and shading of his black and white depictions of ancient portrait heads featured in Donald Lindsay and Mary Price’s A Portrait of Britain Before 1066 (1963) create lively animations of these inanimate objects. 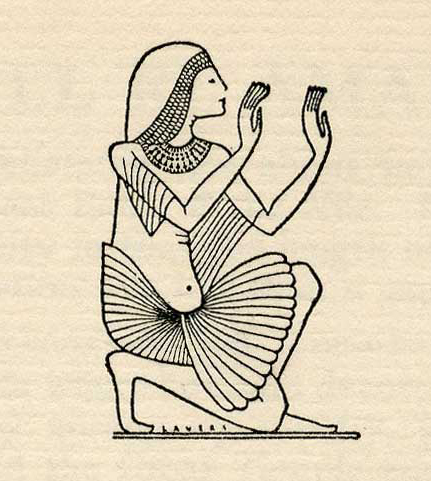 He also illustrated his former colleague Mary Chubb’s memoir of their Amarna days, Nefertiti Lived Here (1954). His sketch of surveying in action at Amarna stretches diagonally across page 74 – at the bottom left hand corner Lavers’ Architect peers through a theodolite towards a workman with measuring rod in the distance at the top right hand corner. Lavers and Waddington were two of many architects who contributed to interpreting and promoting archaeology. In his memoir, fellow AA School architect (and noted archaeologist) Seton Lloyd wrote that his architect’s eye gave him a valuable and distinct window into the past. The AA archives were for me a valuable window into the archaeological architect’s experience, revealing how the practices of architecture and archaeology informed each other – beginning with the holiday pantos. I look forward to my next visit. Brief biographies of Ralph Lavers, Hilary Waddington and Mary Chubb can be found in Who Was Who in Egyptology (Egypt Exploration Society, 4th edn 2012). Chubb, M. 1954. Nefertiti Lives Here. London: Geoffrey Bles. Lindsay, D. and Price, M. 1963. A Portrait of Britain Before 1066. Oxford: Clarendon Press. Lavers, R. 1933. Exhibition of Recent Work of the Egypt Exploration Society. The Architectural Association Journal. Vol XLIX (557): 35-36. Lloyd, S. 1986. The Interval: a life in Near Eastern archaeology. Faringdon: Lloyd Collon. West, L. 1967. An Agricultural Machinery Museum. Agricultural History 41 (3): 267-274. The Times. 1989. Hilary Waddington. The Times Digital Archive. 14 Aug, p. 12.